I went to Iloilo last October 10 with the intention of going to Tibiao, Antique, to get ourselves (me and my wife) immersed in a huge hot bath. In Tibiao, they add herbs to the lukewarm water. 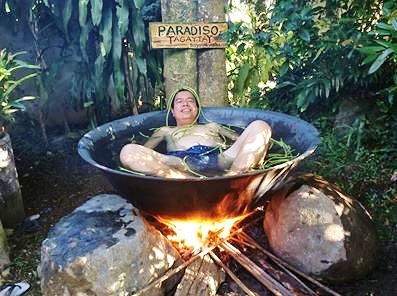 The hot bath is actually a giant “kawa” used in the making of muscovado in the earlier years. Enterprising resort owners made them into a spa. Unfortunately, the heavy rains two days before our Iloilo-Antique holiday caused the bridge connecting Iloilo and Antique to become impassable. Had to content ourselves taking photographs around the southern part of Iloilo, up to San Joaquin where the bridge was located. Took photos of Iloilo’s beautiful churches instead. But my chief destination was Tibiao. Now I do not need to go to Tibiao. I brought Tibiao to my PARADISO in Tagaytay.